Update, May 23, 2015 : The Fictional Woman has won Best Non-Fiction Book Design at the 63rd Australian Book Design Awards, for designers Tara Moss and Matt Stanton from HarperCollins. May 2014: Not so long ago, in a studio in Sydney, we shot the cover of my first ever non-fiction book. The experience was unexpectedly cathartic, and for the photographer, makeup artist and crew, a touch confronting, I was told. I chose labels or ‘fictions’ I had worn for some time – some worn willingly, others unwillingly, some complimentary and some negative, some absolute nonsense, many contradictory, but each label packed with its own baggage. I chose 16 ‘fictions’ or labels and later narrowed it down to 13 that could fit. All of them are very personal to my lived experience, and you can see them on the finished cover. I had not initially hoped that we could fit all the relevant fictions I had personally worn, literally on my face, and still have all of them readable. I imagined we’d have to do it digitally if we used more than five of my chosen ‘labels’. But that’s where the wonderful direction at HarperCollins and the artistry of Becca Gilmartin (shown above, and below) came in. HarperCollins mapped out the words I’d chosen, designing the fit on my face using an old image of me – as seen in my hands – in the hopes that we could make it work directly on my face. (We did clean shots as back ups in case it didn’t work out.) Becca used that guide to draw the words directly on my skin in body paint, one at a time, over the period of several hours as I sat under the lights. She needed to carefully extend the necessary letters as they curved back with the contours of my face, so that they were each readable from the perspective of the lens. If I so much as smirked, my dimples ate letters or entire words. Rather than adding the labels digitally, or indeed manipulating the image digitally in any way (apart from the book title and my name at the bottom of the cover, there has been no retouching/manipulation) we were able to do it all organically, stage by stage, much as the labels themselves had appeared in my life. Becca commented several times that she felt upset having to write certain words on me. Other labels were more positive, and felt good to spell out on my skin. As the crew and publishers watched, two decades of my life was distilled to fictions imprinted on me by others. In a way, it felt like a 5 hour performance, symbolically representing the past twenty years of my life as I moved through various ‘labels’. The Fictional Woman will be launched on May 22nd with HarperCollins Australia. These are my fictions. What are yours? 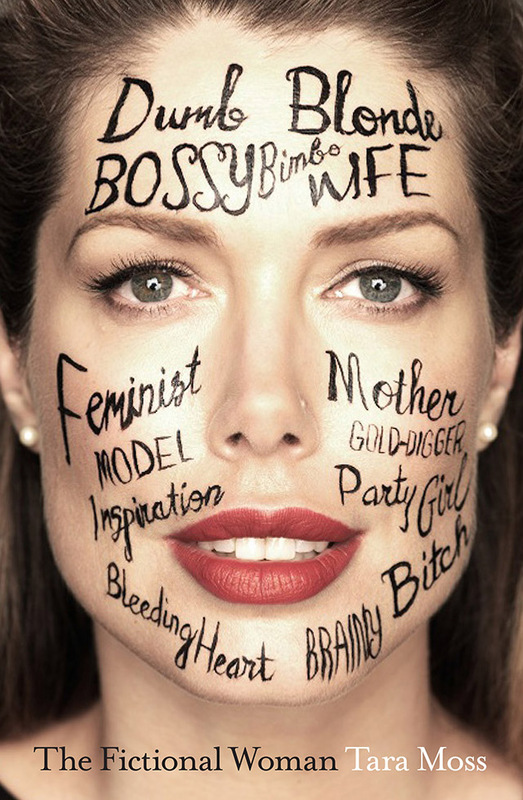 Tara Moss has worn many labels in her time, including ‘author’, ‘model’, ‘gold-digger’, ‘commentator’, ‘inspiration’, ‘dumb blonde’, ‘feminist’ and ‘mother’, among many others. Now, in her first work of non-fiction, she blends memoir and social analysis to examine the common fictions about women. She traces key moments in her life – from small-town tomboy in Canada, to international fashion model in the 90s, to bestselling author taking a polygraph test in 2002 to prove she writes her own work – and weaves her own experiences into a broader look at everyday sexism and issues surrounding the underrepresentation of women, modern motherhood, body image and the portrayal of women in politics, entertainment, advertising and the media. Deeply personal and revealing, this is more than just Tara Moss’s own story. At once insightful, challenging and entertaining, she asks how we can change the old fictions, one woman at a time. I love this so much! I’ve been sewing a costume skin with purely gendered labels on it but you’ve taken it a step beyond to your actual skin. Inspired! Now that’s “Saying Something”. Congrats. I love it! I love your work and can’t wait to read this new book! Wonderful work. I’m very much looking forward to reading your book. Labels can be helpful, if we feel they fit, but they can also be terrible if we fe they fit. True or false, those labels are hard to ignore, but whether we want them or not, they’re there, in the eyes of others, even if not by you. You never fail to amaze and inspire me, Tara! Such cleverness and such courage. I applaud you, and can’t wait to read this book. I hope it does as brilliantly well as you deserve. Whoops I hope they didn’t pick up the permanent marker by mistake! There are many more terms that could be there. Nurturing, Loving, Caring, Sensual to name a few. I look forward to giving the book to my daughter. I’m really intrigued now to read your book, this article’s really resonated with me. I can’t quite put my finger on why except I keep coming back to moments I’ve surprised people, they’ve given me a new label, and then I’ll find myself playing up to that label. Strange. Reading the Fictional Woman in bed with my wife makes me realise there is so much hope for the future for “femininity”. So we now have a small army of you wonderful people. Clarissa Pinkola Estes of (Women Who Run with Wolves), Nicki Gemmell (The Australian), Tara Moss (Fictional Woman), Mary Robinson (Everybody Matters) and my wife Mary (indescribable). I have two daughters who are smart and very capable. Your book is a gift for them in navigating some very confronting realities on their paths to what I hope will be happy and rewarding lives.. Many thanks, Ruth. p.s. please come to Orange to speak soon. Just finished reading your book while working with Papua New Guinean women in the highlands and listening to their stories of gender based violence and silence. Thank you for your vulnerability in sharing your own story and the way you have brought to light so many other issues that our daughters need to grow up challenging. I just finished reading your book. Thank you so much for sharing your story. I found it inspiring, uplifting and thought provoking all at once. I, too have a young daughter who I BF beyond 2( much to the disgust of some family members ….) and who I gave birth to at home. Your work is so important – thank you for using your voice and fame in such a positive way. Just finishing this book. I loved it. I feel that the long road to academia has helped you. Too many writers, feel that they need to prove near point, through a tsunami of facts. Which results in the reader feeling as though they are being hectored. You bring enough data to support your ideas, and then move on, and I appreciate that in a writer.